Throwing around ideas, JS and I thought to make moules frites. But, of course, the frying turned us off the whole affair. Why not eliminate the frying altogether and make "frites" out of polenta? Yes, yes, it's totally not the same. But I thought, if I really want fries, I'll just get them on the outside! We haven't made polenta before, so I used the recipe on the back of the back of cornmeal package. It called for water, but I recommend using some stock, or milk, or a combination. The water by itself was a tad bland. 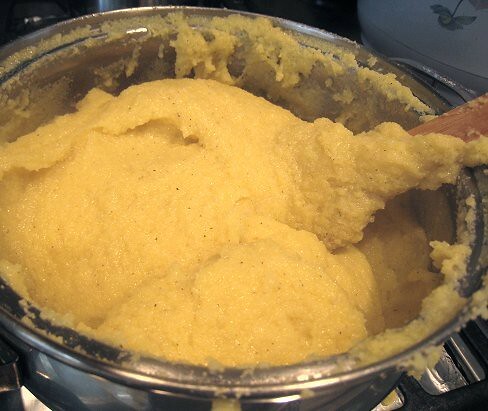 I added cornmeal to boiling water and stirred until the mixture was thick. I seasoned to taste. 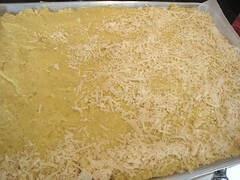 To add more flavor and appeal, I sprinkled grated Parmigiano-Reggiano on top of the polenta, which I spread onto a baking sheet. A short stint under the broiler, and it was done. I simply cut them into rectangles. I decided to go a little Italianesque with the mussels because they were being paired with polenta, after all. I sautéed diced onions and chopped garlic in olive oil, with a little bit or red chile flakes. 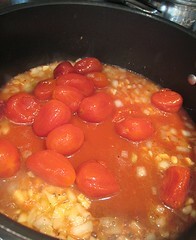 When they were soft, I added a splash of white wine, then some canned tomatoes. The mussels went into the boiling liquid, then I covered the pot. 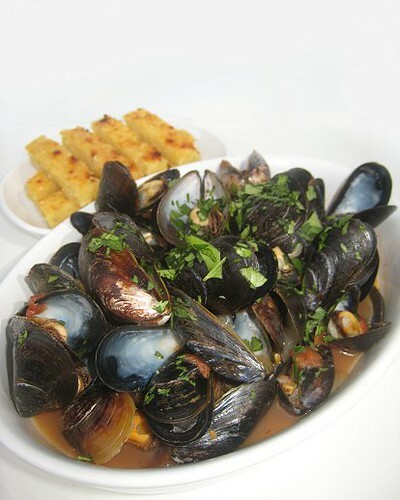 After a few minutes, when the mussels had opened, the dish was done. There you go, our Italianate moules "frites". Not quite the real thing, but satisfying nonetheless. Place liquid in a pot and bring to a boil. When boiling, season with salt. Add the cornmeal and start stirring until the mixture thickens and is cooked, about 15 minutes. 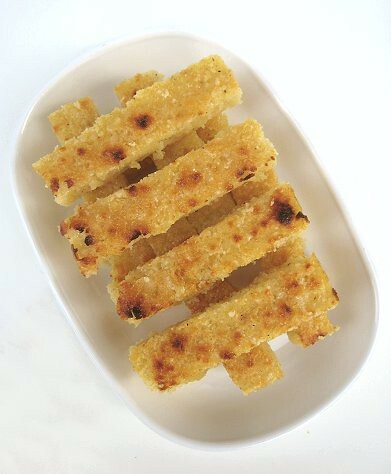 Spread polenta onto a baking pan. To make "fries", sprinkle grated cheese on top and broil until the cheese is golden and bubbly. Cut into slices. Quantities are up to you. 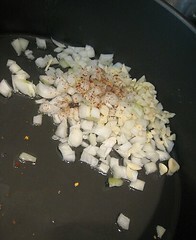 In a pot/pan, heat olive oil and sauté chopped onions and garlic until softened, about 3-5 minutes. Add a splash of white wine, then the tomatoes. 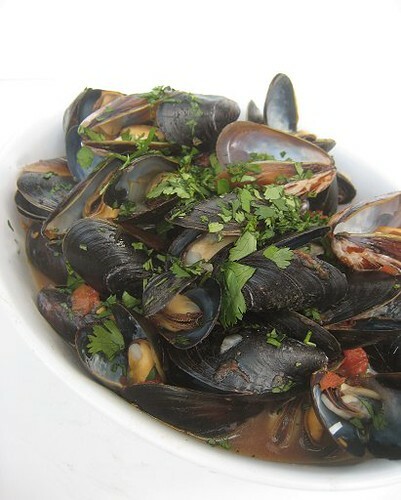 With the heat on high, add mussels. Cover the pot/pan, shake about. In a couple of minutes (longer if you have a larger quantity), check the mussels. 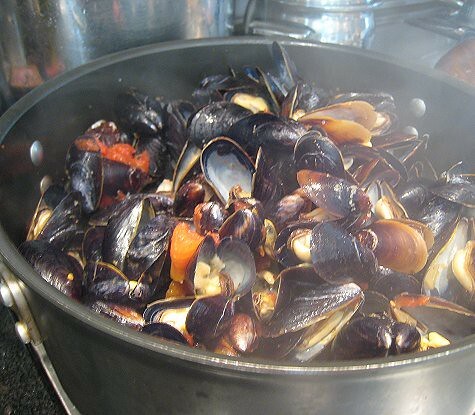 Once the mussels are open, they wre ready to serve. 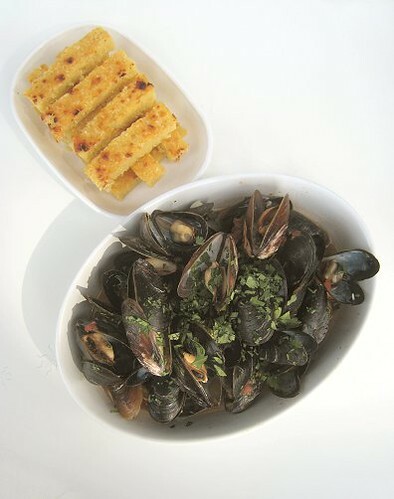 Serve mussels and resulting broth with polenta "fries". 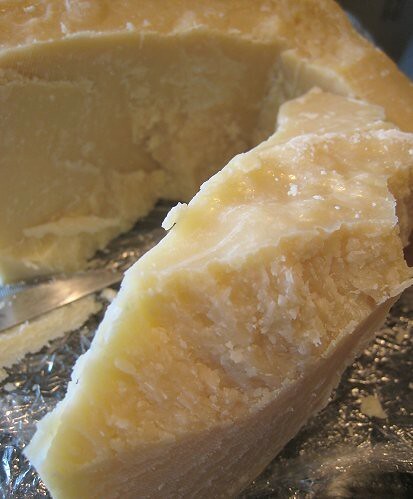 For showcasing CORN/POLENTA/CORNMEAL, we're submitting this post to Weekend Herb Blogging, a world-wide food blogging event (created by Kalyn's Kitchen, now maintained by Haalo of Cook (almost) Anything at Least Once) with the goal of helping each other learn about cooking with herbs and plant ingredients. If you'd like to participate, see who's hosting next week. WHB is hosted this week by Marija of Palachinka. This is such a classic dish, and I love your awesome twist on this! DELICIOUS! I had polenta fries for the first time about a year ago at this fancy schmancy restaurant with my dad...and they were possibly the best fries I'd ever eaten. These look delicious! Looks great! And I agree with you about fries -- if I want them, I eat them outside too. 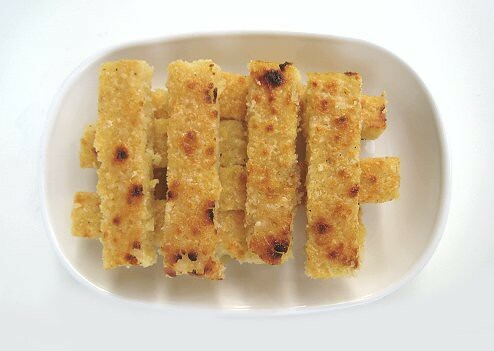 Looks great, and nice healthy alternative to frying, but have you ever tried deep fried polenta? It's heavenly! 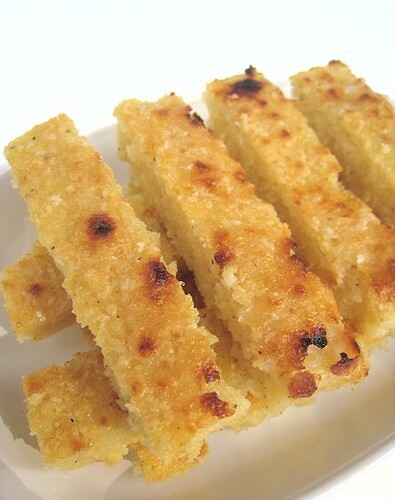 The polenta fries look like dense cakes to me! Interesting pairing with the mussels. Even better than fries. 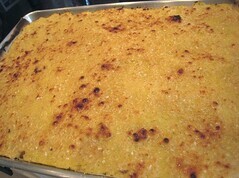 I love polenta! And yes, definitely use chicken broth as water alone isn't enough to give them flavor. That does sound good! Although, it defeats the purpose of avoiding deep-frying (due to laziness). Oh yes, lesson learned. I had to top the whole thing with a vast amount of cheese to flavor it up.